SPARKLING water infused with tetrahydrocannabinol (THC), the active ingredient that causes the marijuana high, hits the shelves this week in California. 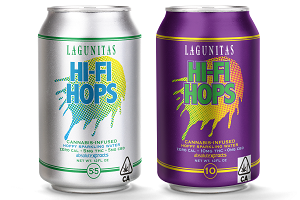 Lagunitas Brewing Company is launching Hi-Fi Hops, an “IPA-inspired” sparkling water containing zero calories and coming in two varieties – one with 10 milligrams of THC and one with five milligrams of THC and five grams of cannabidinol (CBD). California legalised recreational marijuana in January, giving beverage makers like Lagunitas a new path to growth. US experts say as more states legalise recreational marijuana, there are 10, established beer giants and craft newcomers are racing to develop cannabis-infused booze. Interest in marijuana-based food and beverages is becoming increasingly mainstream, too, they say. Legal marijuana sales reached $US9.7 billion in North America in 2017, and the market is expected to hit $US24.5 billion in sales by 2021, rising at CAGR of 28%, according to BDS analytics. US food industry publication Food Dive says though premium water may not seem like a vehicle for THC, consumers are interested in out-of-the-box varieties. “Functional, fruit-infused, botanical and caffeinated sparkling water brands are being joined by hard seltzers, such as Boston Beer’s truly Spiked & Sparkling and Boathouse Brewing’s Spiked Seltzer,” Food Dive reports. “Products like these have helped shift the category into adult beverage territory, and Lagunitas’ Hi-Fi Hops could be similarly well received. “But the brand won’t enjoy the mainstream acceptance of its competitors’ hard sparkling waters — at least initially. “Hi-Fi Hops will only be sold at California distilleries, so its consumer base is fairly niche. “It will be interesting to see if the Heineken-owned brewer will roll out the product to other states where marijuana is legalised, and if its THC-based sparkling beverage has staying power.